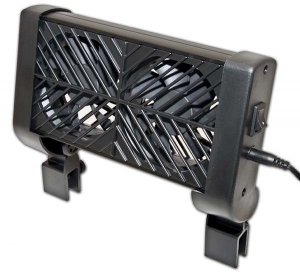 Large cooling fans provide powerful ventilation to reduce heat transference from aquarium equipment. Extremely quiet operation with adjustable positioning, perfect for sumps or for use in aquarium stands/cabinets to reduce humidity. Generates 10 times more cooling power than conventional fans to reduce temperature buildup by 5 to 7 degrees Fahrenheit. Easy to install - simply attach using screw-mounting brackets. High-quality plastic construction. 12V UL-Listed. these fans are a must have! it definitely helps cool down your tank without using a chiller. it’s easy to attach to either your tank or to the sump and you can adjust the direction of it. it really works! i plugged it in and within the afternoon, it dropped my temperature 1 degree. so when my lights come on later, it should help stop the temperature increase dramatically. love it! one thing is that mine is the 4 fan version not this 2 fan version.